The cosmopolitan Ohad Talmor was born in Lyon, France, originally from Israel, grew up partly in Geneva, Switzerland and now American and long time Brooklyn resident. A classically trained pianist, Talmor picked up the saxophone while attending High School in Florida. Don’t let it confuse you. Talmor was mentored early on by the legendary Lee Konitz who helped him groom and foster his dual interests for Composition and Improvisation. Through Konitz’s close relationship, they worked on and co-lead three distinct projects for which Talmor both composed/arranged and played: the Lee Konitz Nonet, the Konitz-Talmor String Project and the Konitz-Talmor Big Band. On his own, Talmor leads a number of flexible groups mirroring his multi-faceted musical identity. A Sextet ; “NewsReel” featuring Drummer Dan Weiss, Pianist Jacob Sacks, Guitarist Miles Okazaki, Trumpeter Shane Endsley and Bassist Matt Pavolka. A Trio version of “NewsReel” featuring Guitarist Miles Okazaki and Drummer Dan Weiss. A Big Band; “Ohad Talmor Grand Ensemble” a big band featuring many of New York’s leading improvisers. A Nonet ; “Mass Transformation” featuring Austria’s Spring String 4tet, Singer Judith Berkson, Guitarist Pete McCann, Trumpeter Shane Endsley and Drummer Mark Ferber. This project focuses on the Music of Anton Bruckner and beyond. Talmor is a member of Drummer Adam Nussbaum’s “Leadbelly Project” featuring Guitarists Steve Cardenas and Nate Radley, and a Collaborative Trio featuring Bassist Steve Swallow and Drummer Adam Nussbaum. Other collaborators include Jason Moran, Josh Redman, Fred Hersch, Kurt Rosenwinkel, Chris Cheek, Carla Bley, Joe Lovano, Chris Potter, Billy Hart and many others, most of whom do not have major recording contracts, which is just as well. Talmor’s interest for bringing together improvisation within the scope of highly sophisticated thru-composed music have him equally involved in writing for Jazz, Electronic or Contemporary Classical Music. 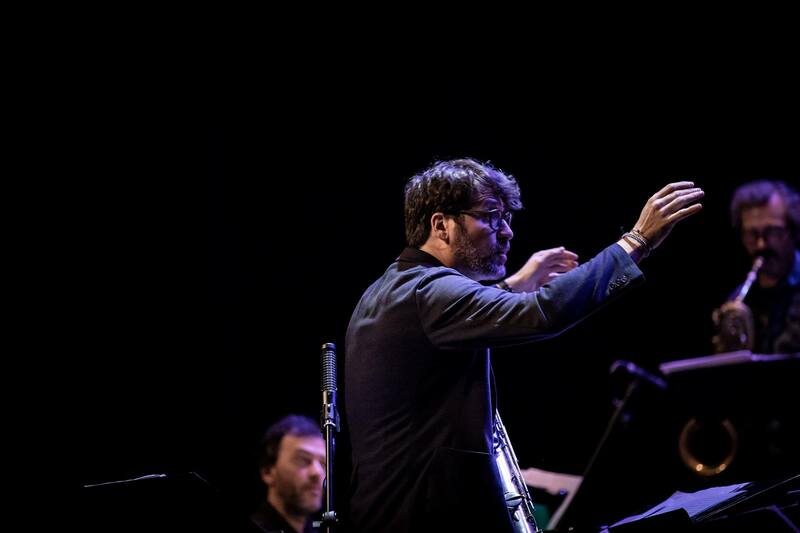 His music has been performed by various ensembles all over the world, including: Portugal’s OJM Big Band, Germany’s WDR Big Band, Brazil’s SoundScape Orquestra, European Radio Jazz Orchestra, Belgium’s Bruxelles Jazz Orchestra. Ohad Talmor contribution in the Contemporary Classical genre includes music composed for the Spring String Quartet from Austria, Porto’s “Casa da Musica” Orchestra, pianist Martha Argerich or Sao Paulo’s Symphonic Band. Talmor’s Double Concerto for Piano/Drums and Double Orchestras was premiered in February 2010 by Porto “Casa da Musica” Orchestra, OJM Big Band and Pianist Jason Moran + Drummer Dan Weiss as featured soloists. His film music credit includes the Sundance Festival Award Winner movie “Low Down“, featuring actors Glenn Close, John Hawkes, Flea and Elle Fanning. Ohad Talmor holds a Composition Degree from the Manhattan School of Music (now buried deeply in a trunk in his basement). “2015 European Broadcasting Union Composer of the Year Award”. Talmor teaches Composition at the Geneva Conservatory (CPMDT/AMR). He is also an Adjunct Professor at the New School and the City University of New York. And everyday, Talmor spends a respectable amount of time playing the Bansuri (Indian bamboo flute) and studying the bottomless heritage of Hindustani music under the tutelage of Bansuri Master Pt Steve Gorn.